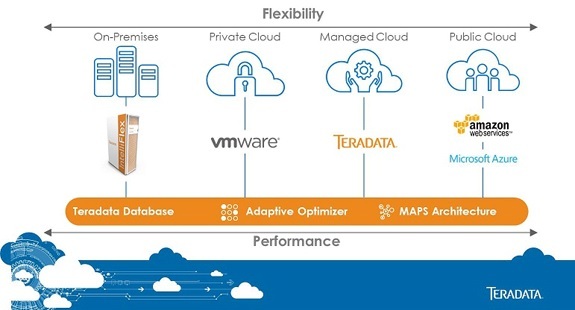 Teradata is thinking outside of box sales with VMware, AWS and Azure deployment options and new solutions and consulting services. At this week’s Teradata Partners Conference in Atlanta the company hit several important cloud milestones with its “Teradata Everywhere” and “Borderless Analytics” announcements. And in another sign that it’s evolving, Teradata also announced a range of analytic solutions supported by consulting services. Teradata Everywhere is the ability to run the same database and workloads without alteration in multiple deployment environments. The choices include on-premises systems, VMWare-based private-cloud instances, Teradata’s Managed Cloud services and Teradata Database on public clouds including Amazon Web Services and, by year end, Microsoft Azure. Teradata Amps Up Cloud & Consulting from Constellation Research on Vimeo. MyPOV on Teradata Everywhere. Teradata pre-announced most of these offerings last year, but it’s good to see it following through on both MPP (without that, what’s the point of using Teradata?) and Microsoft Azure. What was surprising was seeing an Amazon Web Services exec keynoting at Partners. That’s a good sign that Teradata is truly embracing the cloud, but I think the VMware option will be even more popular than the public cloud options -– at least for existing customers. For now, VMware deployment is capped at eight virtual servers and 32 virtual nodes, but that’s big capacity and Teradata says server and node capacities will increase over time. It’s all well and good to have multiple deployment options, but the key to hybrid success is flexible data-access, querying and systems management. The borderless concept is supported by the latest versions of Teradata QueryGrid, for accessing data across heterogeneous environments, and Teradata Unity, for automated workload orchestration across multiple Teradata systems. QueryGrid already supported unified access and querying against Teradata, Teradata Aster, third-party relational databases, Hadoop, and analytic compute clusters. That support extends to cloud instances of these sources. QueryGrid brought together what were separate Teradata-to-Hadoop, Teradata-to-Oracle and Teradata-to-Aster connectors. A rewrite due out by year end will unify the underlying architecture so there will be single connectors for each target system instead of multiple connectors. The new version will deliver better and more consistent query performance, and, according to Teradata, better support for security, encryption and performance monitoring across all sources. MyPOV on Borderless Analytics. QueryGrid is very popular among Teradata customers. Most connections are bidirectional, and it can push down queries into source systems including Hadoop to reduce overall query times. Unity is an extra-cost option, but the automation and workload distribution capabilities are hugely helpful when running multiple Teradata systems. As companies tap cloud instances, they’ll use Unity to support bursting scenarios wherein they seamlessly shift spikey or low-priority workloads into the cloud to better handle peak workloads and meet service-level agreements. Teradata got its start by selling to the business, not IT. In his keynote at Partners, Teradata CEO Victor Lund, who was appointed this spring after Mike Koehler was ousted, admitted that the company lost its way in part because it lost sight of selling to business needs. About half of Teradata’s revenue is already tied to solutions and consulting, but that ratio may grow given the Partners announcement of new analytic solutions, methodologies and accelerators backed by Teradata consulting. Customer Journey Analytic Solution: This offering blends Teradata’s Real-Time Interaction Manager, Customer Interaction Manager and Teradata Aster ensemble analytics to track end-to-end customer paths across channels (email, online, in-store, call center, etc.). It then delivers recommended next-best actions and offers based on historical as well as in-the-moment behaviors. The Customer Journey Analytic solution is differentiated from similar-sounding offerings in that it addresses on-premises and call-center interaction as well as digital channels, says Teradata. And by incorporating real-time context, you’ll avoid pushing offers when someone just received that offer in a different channel, just purchased or is trying to resolve a service problem and is in no mood to purchase. MyPOV on Teradata’s Solutions Focus. Teradata is understandably putting an even bigger emphasis on solutions and consulting given that revenue from on-premises systems is and will remain under pressure. Data warehouse optimization projects are accelerating that trend as companies shift workloads onto Hadoop or cloud options including Teradata’s own services. The shift is one reason Teradata in 2014 acquired ThinkBig Analytics, which specializes in Hadoop and open source services and consulting. In July the company upped the ante by acquiring London-based Big Data Partnership, a startup that provides big data solutions and training. The open question for Teradata is whether it can grow the pipeline of solutions and consulting engagements even as the pace of on-premises deployments and upgrades declines. New hardware purchases have historically triggered such engagements, so Teradata will have to find new ways to get its foot in the door. Another competitive threat is systems integrators that have typically been Teradata partners but that are ramping up analytics practices of their own. Teradata’s enviable list of existing customers and new cloud engagements are obvious places to look for solution and consulting opportunities. What was clear at the Partners Conference is that market forces and this year’s leadership change have sparked both new thinking and a back-to-basics focus on business value. That’s leading to innovation and lots of new deployment and solutions options aimed at fast and flexible deployment and delivering value to the business. (1) Teradata’s consulting revenue is largely driven by its product sales, which are in a long term decline. Cloud isn’t going to stop the decline, and if TDC offers elastic pricing it will get worse. The company is addicted to perpetual licenses, and can’t kick the habit. (2) Even with acquisitions, TDC’s consulting revenue is flat. Declining product sales and flat consulting services add up no credible growth strategy, which means the company is roadkill in the equity markets. (3) It’s very difficult to simultaneously manage a services business and a software business. Customers trust the consulting divisions of software companies for technical services related to implementing products, but not for strategic projects. (See point 1, above). (4) If TDC were serious about transforming itself into a services business, it should have open sourced its more marginal products (like Aster), as Pivotal did with Greenplum. (5) It’s a bit late for TDC to get into solutions. The solutions the company touts compete with similar offerings from folks who have been selling and delivering the same thing for a decade or more. I know you have consistently strong opinions about Teradata (and SAS). If you had to run the company, what would you do/do differently? (1) Sell the company to an acquirer or take it private. “Grow or Go” is the mantra for publicly traded companies; TIBCO and Informatica figured that out a couple of years ago. (2) Once the company is private, focus on profitably serving the existing customer base, which is locked into Teradata for many years to come. I think it’s a bit too late for Aster. More importantly, Teradata has thrown its weight behind Presto and has open sourced Kylo. I think these have better community support and potential than Aster ever could.